Having just moved to Perth, the family and I are very keen to discover what's on offer here. We were driving aimlessly through the hills on a Sunday (doesn't everyone do that? ), following beautiful country roads and enjoying the early autumn scenery when we passed a sign which said something about a lake. Being inquisitive, we followed the signs which led through the gorgeous little towns of Mount Helena and Chidlow to the little hideaway that is Lake Leschenaultia. Apart from having a name one can hardly pronounce, the Lake is gorgeous. There were families having barbecues, a few kids braving the cool temperatures swimming and jumping off the floating pontoon out in the water, lots of people enjoying walks and everyone just relaxing and doing the weekend thing. Behind the little kiosk there's even a camping site, which was inhabited by a few tents, kids' bikes and the usual camping paraphernalia. There are wood BBQs to use when the fire bans are not in place and you can even hire canoes if you haven't got your own. The Lake itself, originally a dam named Chidlow's Well, was created in 1897 by the Western Australian Government Railway to replenish the steam engines which used to travel to Northam, York and further beyond. 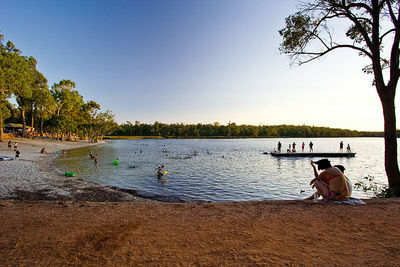 The trains are long gone but the Lake; with its 168 hectares of pristine bushland, abundance of wildlife and water birds, is still here to be enjoyed. We called into the Visitors Centre in Mundaring a day or two later and the very well-informed guy there let us know that the Shire are easing the day-fees payable to visit the Lake. There was no one at the gate on the day we went there and apparently it is soon to be a fully free day out. Awesome. Come and enjoy nature for free, bring your picnic or your BBQ and your walking shoes (bathers if it's warm) and relax in the little piece of paradise that is Lake Leschenaultia. Why? Apart from having a name one can hardly pronounce, the Lake is gorgeous. When: Lake Leschenaultia is open all year round. Where: Lake Leschenaultia is located on Rosedale Road, Chidlow.